Background: Deterioration in vestibular function occurs with ageing and is linked to age-related falls. Sensory hair cells located in the inner ear vestibular labyrinth are critical to vestibular function. Vestibular hair cells rely predominantly on oxidative phosphorylation (OXPHOS) for energy production and contain numerous mitochondria. Mitochondrial DNA (mtDNA) mutations and perturbed energy production are associated with the ageing process. 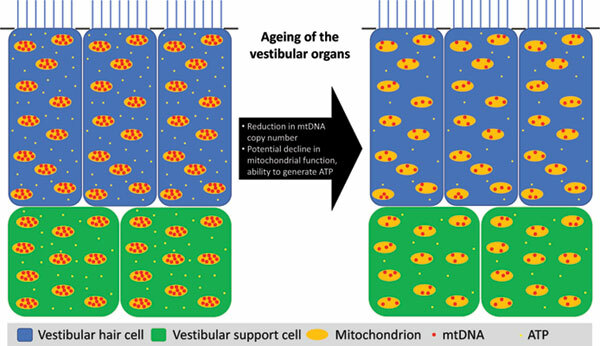 Objective: We investigated the effects of ageing on mtDNA in vestibular hair and support cells, and vestibular organ gene expression, to better understand mechanisms of age-related vestibular deficits. Methods: Vestibular hair and supporting cell layers were microdissected from young and old rats, and mtDNA was quantified by qPCR. Additionally, vestibular organ gene expression was analysed by microarray and gene set enrichment analyses. Results: In contrast to most other studies, we found no evidence of age-related mtDNA deletion mutations. However, we found an increase in abundance of major arc genes near the mtDNA control region. There was also a marked age-related reduction in mtDNA copy number in both cell types. Vestibular organ gene expression, gene set enrichment analysis showed the OXPHOS pathway was down regulated in old animals. Conclusion: Given the importance of mtDNA to mitochondrial OXPHOS and hair cell function, our findings suggest the vestibular organs are potentially on the brink of an energy crisis in old animals. Keywords: Ageing, mtDNA, mitochondria, oxidative phosphorylation, vestibular, hair cell, balance. Keywords:Ageing, mtDNA, mitochondria, oxidative phosphorylation, vestibular, hair cell, balance. Abstract:Background: Deterioration in vestibular function occurs with ageing and is linked to age-related falls. Sensory hair cells located in the inner ear vestibular labyrinth are critical to vestibular function. Vestibular hair cells rely predominantly on oxidative phosphorylation (OXPHOS) for energy production and contain numerous mitochondria. Mitochondrial DNA (mtDNA) mutations and perturbed energy production are associated with the ageing process.